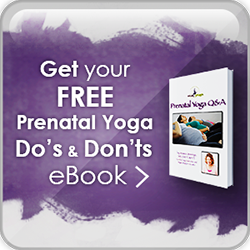 The Yoga of Pregnancy Prenatal Weekend! Who is the Yoga of Pregnancy Prenatal Teacher Training for? The Yoga of Pregnancy Workshop and Teacher Training Weekend is for yoga students and teachers, birth practitioners, moms-to-be and anyone else who wants to delve deep into how yoga can help women access their greatest power, wisdom, and love during the transformative journey to motherhood and beyond. The weekend is packed with super fun, strengthening, inspiring practices to support us in the dance of co-creation, whether we’re pregnant with baby or ideas; therapeutic alignment and sequences to address specific physiological and psychological changes for each trimester; and insights you can use to help yourself or claim the wisdom, power and love of the Divine feminine within. Learning to step into the co-creative flow of the divine feminine will help you approach EVERY creative endeavor in your life in a new way. You will learn to delight in co-creating, and deepen your understanding of how this can help you support any mom-to-be. No interest in teaching prenatal is necessary – just curiosity about how the body changes throughout the process, and in how we can shift our thinking so these changes help us sit deeper in the freedom and grace of the heart space. Many women taken it simply to expand their knowledge, face issues around pregnancy, labor, and motherhood, and support their clients with new tools. If you do choose to take it as a teacher training, you will learn that pregnancy can be a doorway for some many of your students to their highest Self, and how to guide them through the threshold. You will receive a certificate at the end reflecting how many of the 12 hours you completed. You will also be part of our private Facebook Ma Yoga community, where you can always ask questions and receive support along your path. 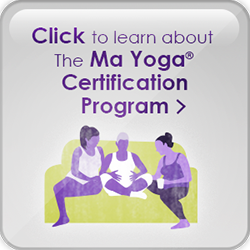 What if I Want My Yoga Alliance Prenatal Certification? 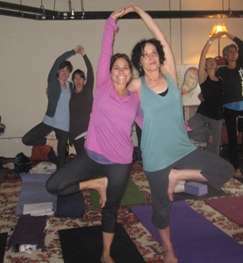 This weekend training is part of the Yoga Alliance Prenatal Certification Program. 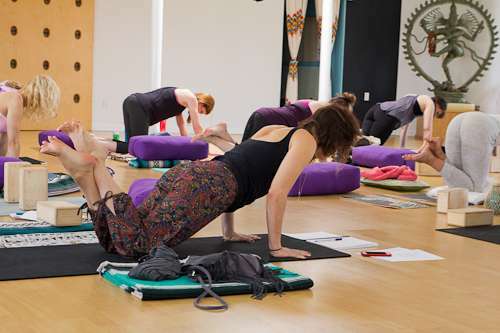 If you are interested in finding out more about the full 85-hour Ma Yoga Prenatal Teacher Training, of which this is weekend is the primary of four required trainings (plus a doula training), please click “Home” above or to go to our teacher training site, please click here. What if I Want to Teach Prenatal Yoga After This? Can I Start a Ma Yoga Class? It depends how ready you feel, and what trainings and experience you’ve already had. To find out if the Yoga of Pregnancy Weekend or the full program is for you, just schedule a FREE 30-minute Dreams and Visions call with me. I can’t wait to hear where you are and what you’re looking for, and see if I can support you on your path. Please go to www.MaYogaLiving.com and go up to “For Instructors” for more details.